Foods,Clothes, electronics, accessories – whatever your need for the hour maybe, Abiramy VTA Exports, your favorite online shopping site, is sure to spoil you with a wide range of products. You don’t have to wait for the weekends to shop as you can shop online on your way back home after work. Almost all popular brands across categories sell their products online, thereby bringing you closer to your preferences. Oh, and let’s not forget about the various discounts on these products which make them an offer that is too hard to resist. So, are you all set to head online and shop? 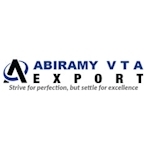 Let’s take a look at what Abiramy VTA Exports has in store for you, shall we?